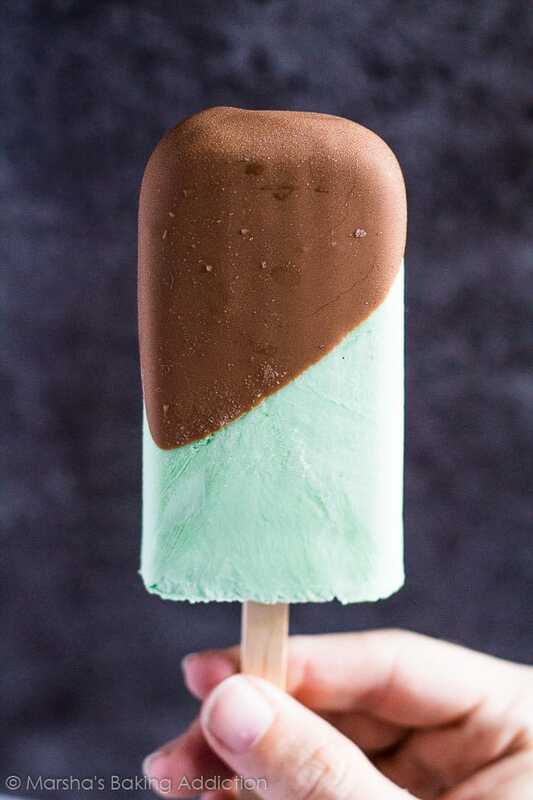 Mint Chocolate Chip Greek Yoghurt Popsicles – Deliciously creamy mint popsicles studded with chocolate chips and dipped in a milk chocolate magic shell! 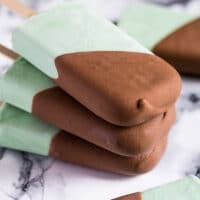 If you don’t know by now, one of my favourite flavour combinations is mint and chocolate, so I course I thought about that combination first whilst coming up with a popsicle flavour. So, today I bring you my scrumptiously creamy Mint Chocolate Chip Greek Yoghurt Popsicles! 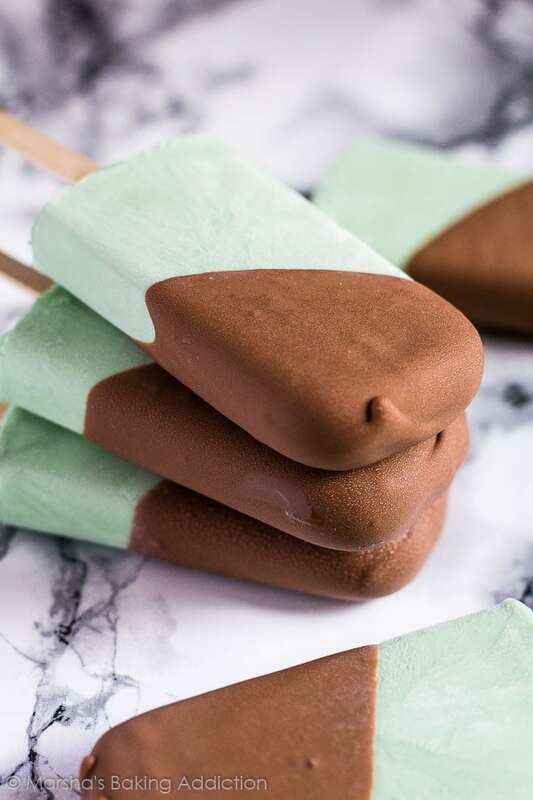 To top these popsicles off, I’ve dipped them in milk chocolate melted with a little coconut oil. 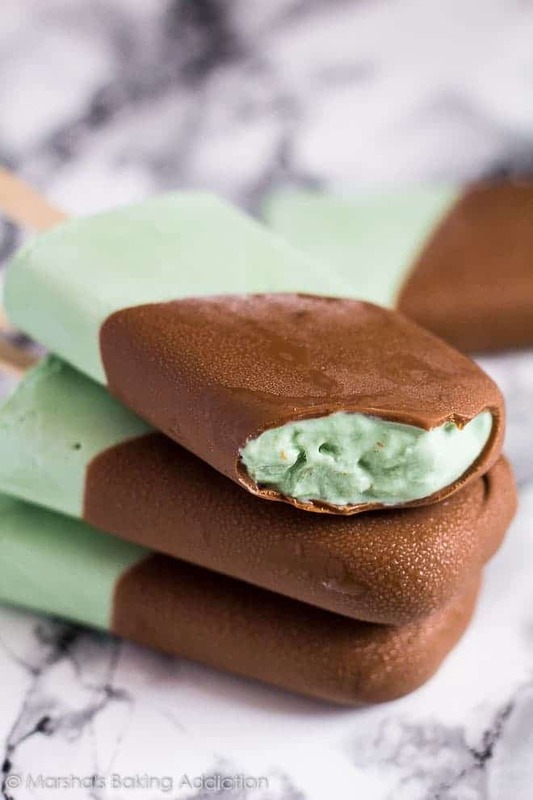 The chocolate hardens beautifully on cold desserts, and complements these mint popsicles wonderfully. To make these popsicles, simply whisk together yoghurt, milk, mint extract, and honey. Add enough green food colouring to reach your desired shade. Stir in the chocolate chips, then pour the mixture evenly into 6 popsicle molds. Sprinkle on some more chocolate chips if desired. Freeze for 2 hours before putting wooden popsicle sticks into the centres. Freeze for a further 4 hours or overnight. perfect for a summer treat! How long will these mint popsicles last? These popsicles can be kept frozen for up to 1 month – but they won’t last that long! 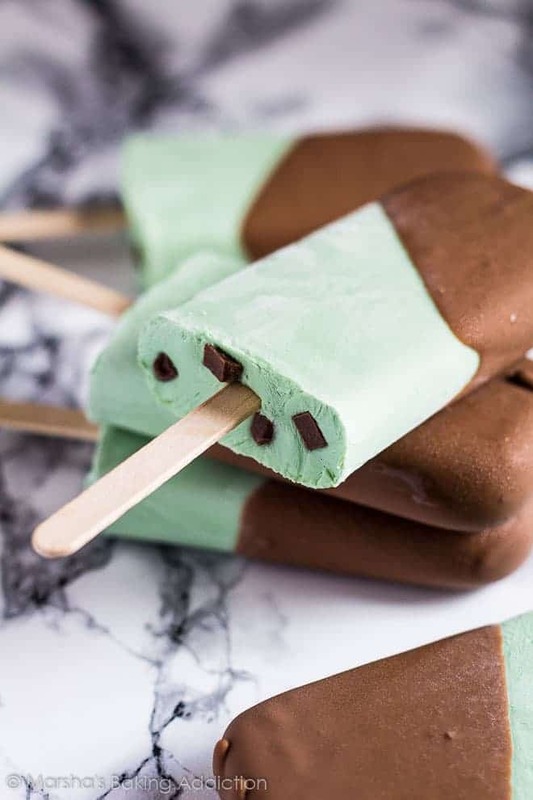 Deliciously creamy mint popsicles studded with chocolate chips and dipped in a milk chocolate magic shell! Whisk together the yoghurt, milk, mint extract, and honey. Add in enough green food colouring to reach your desired shade. Stir in the chocolate chips, then pour the mixture evenly into 6 popsicle molds. If desired, sprinkle on some more chocolate chips. Freeze for 2 hours before putting wooden popsicle sticks in the centres. Freeze for a further 4 hours or overnight. Microwave the chocolate and coconut oil together until melted, stirring every 20 seconds. Stir in the vanilla. Let the chocolate come to room temperature. When ready to serve, run the molds under warm water to remove easily. Dip each popsicle in the chocolate, or drizzle on top. Serve immediately. 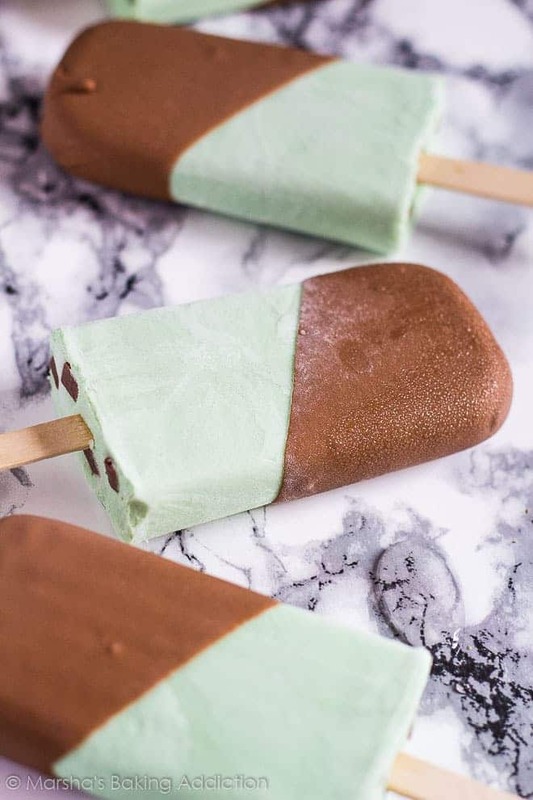 I love mint chocolate chip, and these look great! Thanks for sharing, can’t wait to try! This is such a pretty color and lovely combo. Looks amazing dear! Marsha, these popsicles look heavenly. Exactly what I need during the hot summer days! These would be such a HIT at my place as everyone love desserts with mint flavor. The bars look absolutely stunning. My daughter would go completely berserk for these popsicles. I’m going to have to give it a go! Oooh, I love mint and chocolate in anything! Wonderful popsicles Marsha. Great recipe idea for this summer. Right in the nick of time! 😉 You made such a beautiful popsicle, Marsha. Of course, I’m not surprised one bit! I must say, I am very excited to see you get your autumn bake on! 😉 I’m gearing up to test some recipes too as we speak! Looking forward to seeing yours! Pinned, of course. 🙂 Happy Monday, friend! These popsicles look delicious! I rarely work with ice cream just because it is so difficult to photograph. Looks like you did an amazing job though! Wonderful idea, WOW! May I ask where you got the molds to do them? I can’t wait to try these! I am going to replace the 1/2 cup of chocolate chips with chopped Andes mints! Yum! Greek yoghurt is quite tangy, and if you don’t like that, you can simply use plain yoghurt 🙂 Vanilla greek yoghurt is less tangy and more sweet, and pairs well with the mint and chocolate. Loving the look of these! Will be a tasty treat! I’ve been trying to make my own healthier ice cream so this looks great! I was just wondering what the honey is there for, how does it affect the overall popsicle? It quite possibly could have been my own mistake, but these did not taste right. I feel like maybe the Greek yogurt overpowered the honey??? Good recipe though I used my tried-and-true recipe for the chocolate glaze.